You can’t see it just by looking, but there’s a cause for concern lurking in classrooms across the Triad: unvaccinated children. GREENSBORO, N.C. — It started as one case of chicken pox at the Asheville Waldorf Private School. That bumped up to seven. Then 36 sick kids left medical experts scratching their heads until they looked at the campus’s vaccination records. 72 percent of students did not have the chicken pox vaccine, which is such a high number, the Health Department calls it a community issue. "They go to the grocery store, they go to the library, they go to schools where there is likely to be an immune-compromised person, and now you're risking not only the health of your own child but the public health,” Dr. Lindsay Diamond said. Researchers at the Duke Human Vaccine Institute went even further saying unvaccinated kids put your vaccinated kids at risk. “Absolutely. The thing about vaccines is no vaccine, or truthfully no medical intervention of any type, is perfect," said Dr. Tony Moody. So if you got the vaccine and it wasn’t 100 percent effective for you, being surrounded by unvaccinated people is dangerous. They can pass the disease on to you. But if everyone else has been vaccinated, you’re protected too. It’s called herd immunity. And the Duke researchers say it works for some of the most dangerous diseases like Measles, as long as you don’t have more than 5 percent of the population that’s unvaccinated. “When we see the vaccine coverage start to drop below that, that’s when we get pockets of susceptible people and you can start to get outbreaks," said Moody. 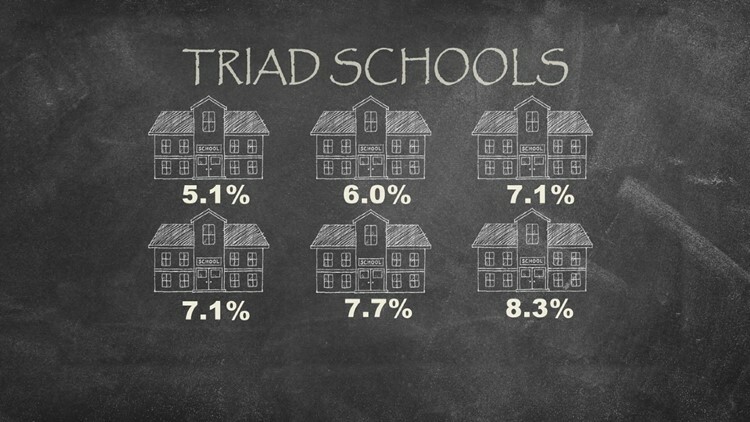 State data shows six large Triad schools had kindergarten classes that fell just above that five percent threshold last year. With the highest rate of unvaccinated students coming in at 8.3 percent. You can search the data for your child's school. This is the most recent information reported by school districts to the state for the kindergarten class of 2017-2018. School leaders and medical experts both say the issue is not at the school level, but with the state law. Legally there are two ways families can opt out of getting vaccines. First students can get a medical exemption signed by a health professional swearing they would have medical side effects from getting the vaccine. 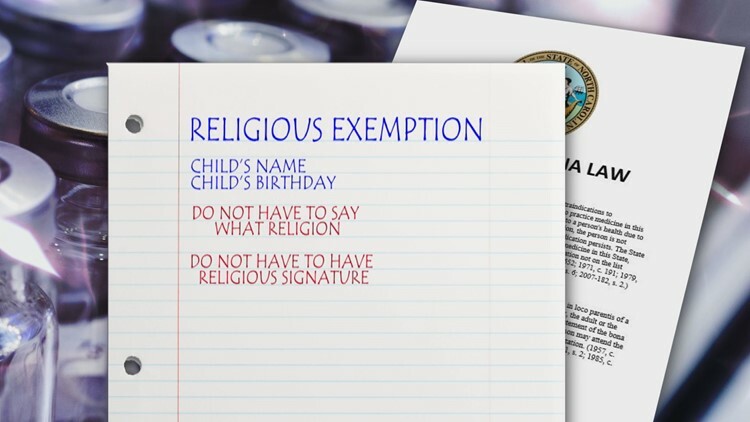 Or parents can submit a note with their child’s name and birthdate saying they have a religious objection. According to Guilford County Schools, state law says they do not have to explain what their religion is or have it signed by a religious leader. “No no, it’s just the signature of the parent," said Yvetta Grier, Director of Health Services & Nursing. “What we would do is of course clean all touch surfaces as well send that information home to parents to make them aware," Grier said. But the experts still say the best shot at keeping kids healthy is making sure they are vaccinated in the first place. “By having enough people vaccinated you reduce the chance that one child can transmit to another child," Moody said. We tried reaching out to many people who do not vaccinate their children for this story. None agreed to go on-camera. But most said their main concern is about vaccine side effects. 30 years ago Congress created a National vaccine Injury Compensation Program. In three decades, they've paid around 6,000 people for problems caused by vaccines. "We work in close proximity with public health officials in Forsyth County. Together we work to mitigate illness should we see a spike in a variety of contagious illnesses within one school. The majority of our school nurses are health department employees and well trained in all areas of public health. If there is a breakout of illness we work to sanitize all areas, communicate concerns with parents and limit exposure to all students as best as the law and proper health practice allows. We work extremely hard over the summer to make sure parents of kindergartners, 7th graders, or parents new to North Carolina understand the importance of vaccinations and health exams as required by law. We work to make sure as many students as possible have access to the vaccines and exams. We have a mobile health clinic that travels the county during the summer and we have a partnership with Wake Forest Baptist Health and the School Health Alliance to manage a medical clinic specifically for students in need at Mineral Springs Elementary/Middle. We attempt to bridge the school and medical community so that we are all working toward the same goal of immunizing and assessing children’s health. We can’t provide healthcare but we can connect with resources to meet their needs. Student health is of upmost importance. Compliance with the state vaccination requirements are something we monitor well past the required 30 day mark. We always want students present at school, healthy and safe to learn. If parents have questions they can always reach out to the school nurse, school leadership, or the Forsyth County Health Department." There are a lot of myths out there when it comes to vaccinations. That's why we're separating fact from fiction. The most common claim: vaccinations cause autism. Not only has that theory been proven wrong, but there has never been any scientific data to support the claim. Then there's the thought that a vaccination, like the flu shot, can give you the flu. The flu shot cannot cause the flu. However, it can spark mild flu-like symptoms but that only means the shot is working. Have you heard that if vaccinations stop, diseases will return? The World Health Organization said when vaccinations stop, diseases that have become uncommon can come back and quickly spread. If you have strong feelings about vaccines or a personal experience you'd like to share with others, reach out to Ben Briscoe on Facebook. He'd love to hear from you.